Navy veteran Lyle Dussault lost all use of his legs after sustaining injuries in the Vietnam War. For years he has been an ardent volunteer for the Healing Waters Fly Fishing organization, which provides assistance to dozens of disabled veterans. Many of these veterans are at life’s edge, but still receive the opportunity to learn a hobby such as fly-fishing. This helps to develop fellowship and restores each veteran’s ability to enjoy the great outdoors. Lyle has been unable to traverse through the woods for many years due to his loss of mobility. 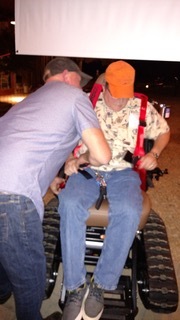 Now, his new Trac Fab chair will let him have a new sense of freedom. When Lyle first learned that someone would be getting a chair, he was so excited. Then, when he learned that it was going to be him, he broke in to tears. Healing Waters has been very supportive of Defender Mobility and relies on us to serve as the conduit between their organization and the freedom being delivered to our veterans. It is our honor to have partnered with them in this effort. 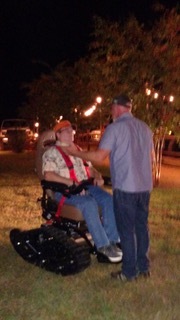 Ed Humpert from Bad River Outdoors in St. Charles, MI helps Defender Mobility purchase and deliver each Trac Fab chair to their deserving recipients. He is seen in the photos below providing Lyle with his initial instruction. 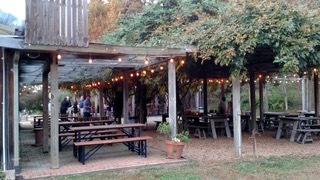 We were very fortunate to have a 10-foot beaver-tail trailer donated by a local trailer dealer in the Charlottesville, VA area to transport the large chair. This chair is the second Trac Fab chair Defender Mobility has delivered for Healing Waters and is the 14th (wow, how amazing!) chair that Defender Mobility has delivered in the past 37 months. Our goal was one every three years! None of this would have been possible without the participation and support of our POAM members! We are so grateful for all of your help. Two more chairs are scheduled for delivery in the next 45 days. Make sure to look for updates as we’ll be sure to keep you posted. Thank you again to each and every individual supporting Defender Mobility. You are making dreams come true! I am honored to see each dream come true I hope these updates give you a sense of the achievements your generosity has provided.